Turning a theatre stage into a temporary ice rink is no easy task. A strict timetable needs to be followed in order for the ice rink to be ready in time for rehearsal skating at 5:00pm on our Tuesday opening night. The work starts every Monday morning at 7:00am when the technicians arrive at the venue and start unloading our two 45ft trucks with the help of 18 theatre technicians. The trucks carry not only the ice rink, but also the costumes, sets, sound and lighting equipment. After everything is connected on the stage, we then connect the header pipes to our chiller units outside the theatre and start to fill the system with a mixture of glycol (antifreeze) and water. Once this is circulating throughout the pipes we turn the chillers down to a temperature of minus 15 degrees. The outside of the pipes will frost over and at this point we spread four tonnes of crushed ice over the pipes. This basically gives us a head start in the ice making process. The time now has usually reached 6:00pm on the Monday evening. Overnight and throughout Tuesday, the rink is sprayed carefully every 15 minutes until some three inches of thickness is achieved. This will take until approximately 3:00pm in the afternoon, when final dressings are given to the top of the ice surface in order that it is perfectly smooth for the rehearsal and performance, some 34 hours after work began. Once the rink is completed, the surface temperature is constantly monitored day and night throughout our stay at the theatre. 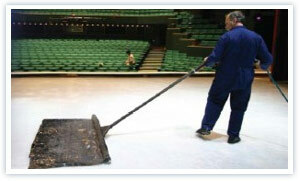 In addition to this, during the interval and after each performance of the show, the surface is scraped and resurfaced with hot water to keep it as smooth as possible.